Restoration biologists continued an annual juvenile shad survey on the Choptank River. 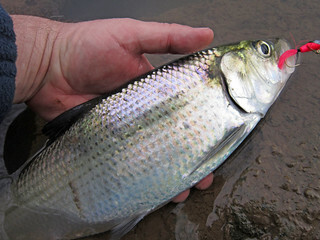 The survey assesses American shad stocking efficacy and serves to estimate wild origin juvenile shad abundance in the restoration target tributary. In 2017, collections on the Choptank River totaled 476 juvenile American shad after 11 weeks of sampling. Funding from the Maryland Department of Transportation Port Administration supports a stocking project for larval and juvenile American shad and hickory shad in the Patapsco River. This is a multi-year restoration effort managed by the Hatcheries Division. The project is complementary to ongoing restoration work in the river conducted by the department's Fish Passage Program, the Maryland Biological Stream Survey, American Rivers and the U.S. Fish and Wildlife Service. All of these groups are working together to support ecological restoration of the Patapsco River. The stocking project includes fish culture, stocking and assessment of historically important migratory species. In 2017, the project stocked 300,000 American Shad and 837,000 Hickory Shad into the Patapsco River. The 2017, restoration biologists collected, tagged and released three male and one female Atlantic sturgeon in Marshyhope Creek, a tributary to the Nanticoke River. This brings the project total to 24 tagged fish. Captured fish were marked with a T-bar tag, passive integrated transponder tag and acoustic transmitter, and tissue was taken for DNA analysis. The VEMCO acoustic transmitter is placed in the body cavity while the fish is under sedation. The transmitter allows the fish to be detected by any researcher using compatible detection gear anywhere in the world. As a member of the Atlantic Cooperative Telemetry Network, the Maryland Department of Natural Resources can detect and identify any VEMCO tagged fish or mammal that travels within range of our receivers. The research is conducted under National Marine Fisheries Service permit No. 16547-01. In 2017 project staff continued to monitor receivers in the Choptank River, Pocomoke River, Nanticoke River and Marshyhope Creek. About 400 juvenile and sub-adult Canadian-origin Atlantic sturgeon are being held in multiple aquaculture facilities throughout Maryland. These fish are cultured for scientific research on spawning techniques, sperm cryopreservation, husbandry, marking methodology, feeding and nutritional studies and genetic analysis. Manning Hatchery produces hybrid striped bass for stocking in Western Maryland. During the year, 650 fingerlings were transported to the Maryland Department of Juvenile Service's Meadow Mountain Youth Camp in Garrett County, where they are cultured as part of the facility's aquaculture curriculum and later stocked. For the year, 3,030 hybrid sunfish were provided to fishing derbies and rodeos throughout the state. dnr.maryland.gov/fisheries/Pages/youth/rodeo.aspx. Manning Hatchery produced 2,115,000 striped bass fry for research, educational outreach and stocking purposes. In 2017, Albert Powell Hatchery and Bear Creek Hatchery both received an "A" classification rating for fish health from the U.S. Fish and Wildlife Service Northeast Fishery Center Fish Health Laboratory. This rating is granted only after a facility tests pathogen-free for three consecutive years. This is important for the program, which has committed to strict biosecurity and fish health protocols the past nine years.